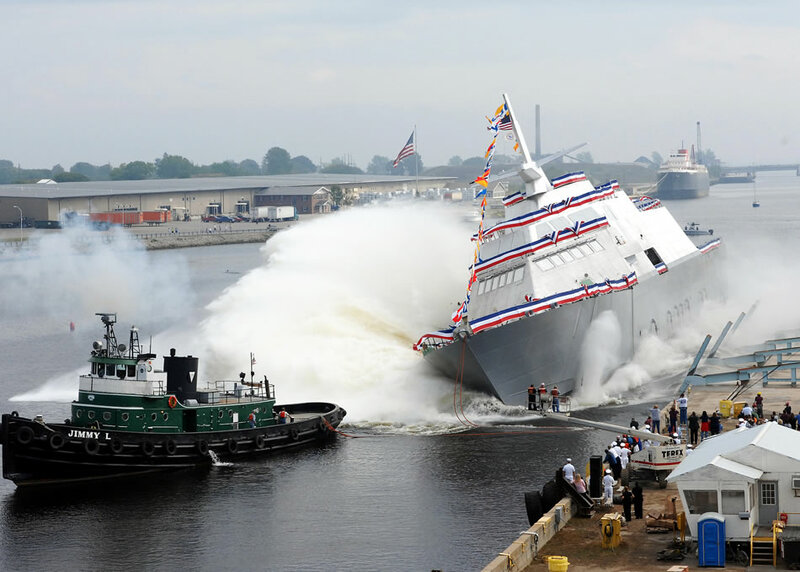 Marinette, Wis. (Sept. 23, 2006) � The nation�s first Littoral Combat Ship, Freedom (LCS 1) � the inaugural ship in an entirely new class of U.S. Navy surface warships � makes a spectacular side launch during her christening at the Marinette Marine shipyard. The agile 377-foot Freedom -- designed and built by a team led by Lockheed Martin -- will help the U.S. Navy defeat growing littoral, or close-to-shore, threats and provide access and dominance in coastal water battle-space. Displacing 3,000 metric tons and with a capability of reaching speeds well over 40 knots, Freedom will be a fast, maneuverable and networked surface combatant with operational flexibility to execute focused missions, such as mine warfare, anti-submarine warfare, surface warfare and humanitarian relief. Photo released courtesy Lockheed Martin.